Harald Bluetooth was king of Denmark in the late 900. He managed to unite Denmark and part of Norway into one kingdom then introduced Christianity in Denmark. He left a large monument, the Jelling rune stone, in memory of their parents. Bluetooth died in 986 during a battle with his son, Svend Forkbeard. The choice of name for the standard indicates how important companies from the Nordic region (which includes countries such as Denmark, Sweden, Norway and Finland) for the communications industry, even if the name tell very little about the technology. The art of connecting things is becoming increasingly complex. In this article we will see a method of connecting devices, called Bluetooth, which can streamline the process. A Bluetooth connection is wireless (even in Brazil it is common to use the English term, wireless) and automatic, and has several interesting features that can simplify our daily lives. How much data will be sent at a time? For example, serial ports send data one bit at a time, while parallel ports send several bits at a time. As they talk with each other? All parties to an electronic discussion should know the meaning of the bits and the message they get is the message sent. This means developing a set of commands and responses known as a protocol. The bluetooth takes local networks (small area) a step above by eliminating the need for user intervention and keeping transmission power extremely low saving battery power. Imagine this: You're with your Bluetooth-enabled cell phone outside of your home. You tell the person across the line to call you back in five minutes, so you can come home and put your stuff. Once you're at home, the map that you received on your cell phone via bluetooth GPS system of your car is automatically sent to your Bluetooth-enabled computer, because your cell phone picked up a Bluetooth signal from your PC and automatically sent the data you designated for transfer. Five minutes later, when your friend calls you back, your home phone comes with Bluetooth is that instead of your phone. The person called the same number, but his home phone picked up the Bluetooth signal from your phone and automatically redirect the call because it realized that you were home. Each transmission signal to and from your cell phone consumes just 1 milliwatt of power, so that the load on your phone is virtually unchanged throughout the procedure. It provides agreement at the physical level (Bluetooth is a standard radio frequency). It provides agreement at the protocol level by which need to agree on when bits are sent, how many should be sent at a time, and how the parties in a conversation can be sure that the message received is the same as the message sent. The great thing about Bluetooth is that it is wireless, inexpensive and automatic. There are other ways to get around using wires, including infrared communication. Infrared (IR) refers to light waves of a lower frequency than human eyes can receive and interpret. 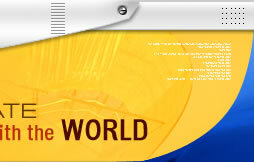 Infrared is used in most systems, remote control television. Infrared communications are fairly reliable and not much more expensive devices, but have some drawbacks. First, infrared technology is a "line of sight." For example, you have to point the remote at the TV or DVD player to make things happen. The second drawback is that infrared technology is almost always a "one to one." You can send data between your desktop and your laptop computer, but not between your laptop and your PDA at the same time. See How Remote Controls Work to learn more about infrared communication. These two qualities of infrared are actually advantageous in some respects. As the transmitters and IR receivers need to be aligned with one another, is uncommon interference between devices. The nature of "one to one" of infrared communications is useful to ensure that the message reaches only the intended recipient, even in a room full of infrared receivers. The Bluetooth aims to solve problems related to infrared systems. The Bluetooth 1.0 standard, the oldest, has a maximum transfer speed of 1 megabit per second (Mbps), while Bluetooth 2.0 can manage up to 3 Mbps. Bluetooth 2.0 is compatible with 1.0 devices. In August 2007, was the standard version 2.1 + EDR (Enhanced Data Rate), which facilitates the process of pairing (pairing) and increases security of the connections. Let's find out how the Bluetooth network. The Bluetooth network transmits data via radio waves of low power. It communicates on a frequency of 2.45 GHz (to be exact, between 2.402 GHz and 2.480 GHz). This frequency band, called the ISM has been reserved by international agreement for the use of industrial devices, scientific and medical. A number of devices you use takes this same radio frequency band. Baby monitors, remote controls for garage doors and the newest generation of cordless phones use frequencies in the ISM band. 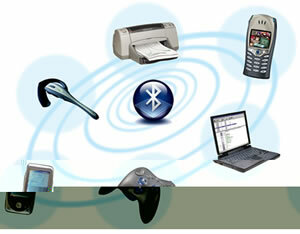 To ensure that all Bluetooth devices do not interfere with each other is part of the process. 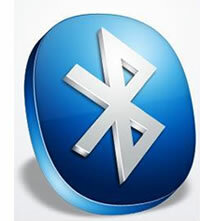 One of the ways Bluetooth devices avoid interference to other systems is sending weak signals of about 1 milliwatt. To compare, the more powerful phones can transmit a signal of 3 watts. The low power limits the range of a Bluetooth device to about 10 meters, reducing the possibility of interference between your computer system and your portable telephone or television. Even with this low power, Bluetooth does not need to be pointed directly between devices that communicate. The walls of your home do not own a Bluetooth signal, making the standard useful for controlling several devices in different environments. Bluetooth can connect up to eight devices simultaneously. With all these devices with the same radius of 10 meters, you may find that mutual interference will occur, but this is unlikely. Bluetooth uses a technique called frequency hopping spread spectrum, which makes it nearly impossible that more than one device transmits at the same frequency at the same time. With this technique, a device uses randomly selected 79 individual frequencies within a designated range, changing from one to another with regularity. In the case of Bluetooth, the transmitters change frequencies 1,600 times per second, which means that many devices can fully utilize a limited slice of the radio spectrum. Like all Bluetooth transmitters automatically use spread spectrum transmission, it is unlikely that two transmitters share the same frequency simultaneously. This same technique minimizes the risk of interference from portable phones or baby monitors in Bluetooth devices, since any interference on a particular frequency lasts only a split second. When Bluetooth devices come into range of each other, communication takes place to determine if they have one or sharable data should control the other. The user does not need to press a button or give a command - communication happens automatically. When the conversation ends, the devices - be they part of a computer system or a stereo - form a network. Bluetooth systems create a personal area network (PAN) or piconet, that can cover a room or to a maximum distance between the phone and the headset on your belt in your head. 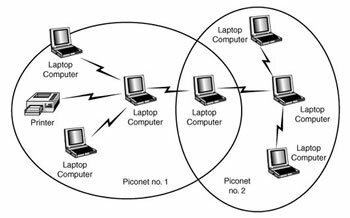 Once a piconet is established, the devices randomly hop between frequencies in unison to stay in touch with each other and to avoid other piconets that may be operating in the same space. In the next section, we will see an example of a system connected to the bluetooth. Suppose you have a modern living room with modern equipment. There is an entertainment system with a stereo, a DVD player, a satellite TV receiver and a television, there is also a cordless phone and a computer. Each of these systems uses Bluetooth and each forms its own piconet to talk between the main unit and its peripheral. The cordless phone has a Bluetooth transmitter at the base and another in the handset. The manufacturer has programmed each unit with an address that fits within an address range established for a specific type of device. When the base is first turned on, it sends radio signals asking for response from any units to address in a particular band. Since the handset has an address in that range, he says, and a tiny network is formed. Now, even if such a device receives a signal from another system, it will ignore it because this is an external signal to the network. The computer and entertainment system go through similar routines, establishing networks among addresses in ranges established by manufacturers. Once the networks are established, the systems begin talking among themselves. Each piconet frequency jumps randomly through the available frequencies, so that all piconets are completely separated from each other. Now the living room has three separate networks established, each consisting of devices that know the address of transmitters it should listen and address of recipients who to speak. Since each network changes its operating frequency thousands of times per second, it is unlikely that any two networks share the same frequency simultaneously. If this occurs, the resulting interference will only last a split second and software designed to correct such errors discards the conflicting information and continue with the network activity. Safety is a concern in any wireless network setup. 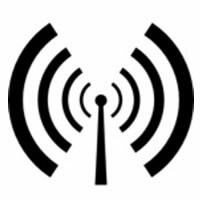 Devices can easily grab radio waves from the air, people who send sensitive information over a wireless connection need to take precautions to ensure that these signals are not intercepted. Bluetooth technology is no different - it's wireless and therefore susceptible to spying and remote access, just like WiFi is susceptible if the network is not secure. With Bluetooth, however, the automatic nature of the connection, which is a great benefit in terms of time and effort, is also beneficial to people who try to send data without your permission. Bluetooth offers several security modes, and device manufacturers determine which mode to include in a Bluetooth-enabled gadget. In most cases, Bluetooth users can establish "trusted devices" that can exchange data without asking permission. When any other device tries to connect to the phone user has to decide to allow it. The security level of service and the security level of the device work together to protect Bluetooth devices from transmitting unauthorized data. Security methods include authorization and identification procedures that limit the use of Bluetooth services to registered users and require users to make a conscious decision to open a file or accept a transfer of data. While these measures are enabled phone or other device the user the possibility of an unauthorized access is minimal. A user can simply switch his Bluetooth mode to "invisible" and completely block the connection with other bluetooth devices. If a user uses the Bluetooth network primarily for synchronizing devices in the home, this may be a good way to avoid any possibility of a security breach while in public. In addition, mobile virus writers have taken advantage of the automated process of connecting bluetooth to send infected files. However, like most cell phones use a secure Bluetooth connection that requires authorization and authentication before accepting data from an unknown device, the infected file typically does not spread. When the virus reaches the cell phone user, it must agree to open the file and agree to install it. So far, this has prevented most viruses cause cellular damage. To learn more, read How Cell-phone Viruses. Other problems such as "Bluejacking", "bluebugging" and "Car Whisperer" have emerged as specific security issues bluetooth. Bluejacking involves Bluetooth users sending a business card (just a text message, actually) to other Bluetooth users within a radius of 10 meters. If you do not check the contents of the message, it can allow the addition of contact to your address book and send him messages that can be automatically opened because they come from a known contact. Bluebugging is a worse problem because it allows hackers to remotely access a user's phone and use its features, including making calls and sending text messages without the user noticing what is happening. The Car Whisperer is a piece of software that allows hackers to send audio and receive audio from a Bluetooth stereo car. As a security breach of a computer, these vulnerabilities are an inevitable result of technological innovation, and device manufacturers are releasing new versions of pre-recorded software that solves problems as they arise. Didn’t know how Bluetooth works until I read this post, tkhnas! Learned something new today.Sanjay’s recent post ..